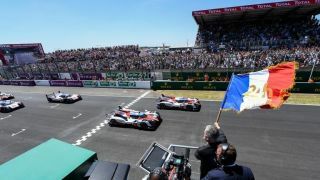 If you intend to watch the 24 Hours of Le Mans from the comfort of your own home, it's being broadcast around the globe across various networks - so keep reading to see where. The main event at the Circuit de la Sarthe runs from Saturday, June 16 to Sunday, June 17, beginning at 2.30pm local time - that's 1.30pm BST, 8.30am Eastern, 5.30am Pacific, and 10.30pm AEST. Rev your engines and get the coffee pot on - one of motorsport's most prestigious events is here again, as some of the best drivers in the world prepare themselves for the 24 Hours of Le Mans. We have all the Le Mans live stream details right here, including an option to watch it all for free. Concentration and endurance is the name of the game at the Circuit de la Sarthe and this year's race is gearing up to be a cracker. No doubt grabbing much of the attention in France will be F1 supremo Fernando Alonso, who makes his Le Mans debut with Toyota. Alonso is in pursuit of motorsport's unofficial but coveted triple crown, and with the Indy 500 and Le Mans currently eluding him, the Spaniard will be determined to prove he's got what it takes away from the F1 track. Another intriguing Le Mans debutant from F1 is Jenson Button, who'll be behind the wheel for SMP Racing. Will either of the former McLaren teammates be able to dethrone 2017 winners Porsche for their respective cars? Live stream Le Mans 2018 from wherever you are in the world this weekend (yes, all of it!) via one of the options below and you'll be among the first to find out. We've got handy tips on how to watch it all absolutely free. Good news Le Mans fans – free-to-air broadcaster France Televisons will be live streaming the entire 24 Hours of Le Mans 2018 via its website. So, with one of the high-speed, high-quality VPN options we've outlined below, you'll be able to watch the race for free no matter where you are in the world. Simply tune into the French broadcaster's website, set your VPN location to France, and enjoy the race. If you manage to make the full 24 hours, you have our full respect. This is the #1 rated best VPN in the world right now. You can watch on many devices at once including Smart TVs, Fire TV Stick, PC, Mac, iPhone, Android phone, iPads, tablets etc. Check out Express VPN and get 15 months for the price of 12. For the first time ever, the Le Mans endurance race will be shown on Velocity in the US, with the full 24 hours broadcast live for your viewing pleasure. Even better, those seeking a live stream on the move can do so via Velocity's MotorTrend.com site and Motor Trend mobile app. At present, Motor Trend is a separate $4.99 per month subscription that isn’t included with a typical cable package. If you're a cable cutter and don't mind the French commentary, then you may be better off using a VPN to tap in to that French free-to-air broadcast as described above. Velocity's coverage means Canadians will be able to get in on the Le Mans 2018 action in the same way as their US neighbours can. Velocity's TV channel plus its MotorTrend.com site and Motor Trend mobile app will be live streaming the full race from France. And if you can't access that or want to watch a broadcast in another territory, then there's always that VPN route. For UK residents, the Le Mans 24 Hours will get the Eurosport treatment. That means Eurosport 1, available in lots of broadcast and streaming forms, is the channel you need this Saturday and/or Sunday. Eurosport is available with basic Sky TV packages or with a Eurosport Player monthly or annual pass - a free trial for which is available here - that also gives you access across loads of devices. Want to access the action but are outside the UK? Then grab a VPN service and change you IP to a UK location. Australia is getting Le Mans 2018 via Eurosport too. That means it can be watched via the Eurosport website or through the app or, of course, via a broadcaster that offers the channel. Those based down under who don't have the TV channel may want to try out the Foxtel Sports Combo pack to access Eurosport, as this currently has no lock-in contract and is offering the first month free until June 30. The pack will also enable you to stream the Le Mans 24 Hours free using the Foxtel App. Which other countries can I stream the Le Mans 24 Hours live using a VPN? A VPN will enable you to watch Le Mans 2018 from literally anywhere. So that obviously includes all the countries from which the players come from, so: Spain, Japan, South Korea, China, India, South Africa, Thailand, Germany, Italy, Sweden, Austria, Belgium, Argentina, Chile, Venezuela and Fiji.